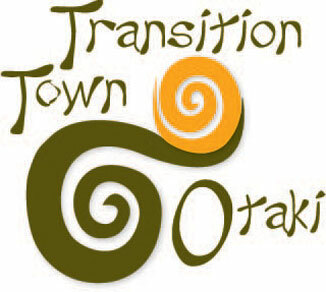 Since 2007, Transition Town Otaki (TTO) has worked on finding ways for a small community to grapple with change, to “think global, act local”. “The global threats of seven years ago are even more pressing now—climate change, the need to find energy sources other than oil, growing and ageing populations, the threat of unlimited growth bringing economic contraction and collapse,” said founder Deirdre Kent. British permaculture teacher Rob Hopkins founded the now world-wide Transition movement in 2006 in the small UK community of Totnes. Deirdre heard him speak in Taupo, came home to Otaki and organised regular meetings, film evenings and speakers to raise awareness of the issues. A group developed and action followed, what founder Rob Hopkins calls “the power of just doing stuff”. He says the well-being of the community and its economy lies with people rolling up their sleeves, getting together with their neighbours –“whether they start small or big, they’re finding that just doing stuff can transform their neighbourhoods and their lives.” (transitionnetwork.org). Deirdre’s passion for building community led her to found the Otaki Timebank, with the help of real estate agent Grant Robertson. Now the West-Tararua Timebank it offers an opportunity for members to exchange their skills and time in return for credits rather than money, with which they can “buy” someone else’s time. All hours are of equal value–an IT expert, a gardener and a hair-dresser get the same credits for their hour’s work. TTO member Jamie Bull’s brain-wave was Otaki’s Seasonal Surplus Stall, where home gardeners can sell their excess fruit and vegetables and buy what they don’t have. Members of TTO’s Food Group run the stall on Thursday mornings from October until May. “Over the last five years it’s gone from strength to strength,” said Jamie. “We have regular growers and buyers who queue up and are keen to try anything new. People also bring along their seeds and seedlings to exchange or sell, which fosters the whole idea of self-sufficiency and home gardening. The Food Group also runs garden visits and workshops and has recently planted its second communal garlic plot. TTO treasurer Jill Brown applied for council funding for a community mulcher and continues to run a mulcher club. Local people can join, get trained and have the use of an efficient mulcher without the expense of buying one or paying a contractor. TTO holds well-attended monthly potluck gatherings featuring speakers or DVDs, either at members’ homes or local venues such as Casa Romana or The Telegraph Hotel. Topics are wide-ranging yet relevant to the main theme of sustainability—food, energy, housing, education and more. At the July 30 gathering Fonterra engineer David Rumsey is to speak on his recent visit to the German town of Wildpoldsried and its outstanding advances in both saving and generating energy. Local IT expert Miriam Richardson runs the group’s website and editor Batch Hales keeps the group informed with a monthly email newsletter. Wednesday 27 August, 6pm, 485 Otaki Gorge Rd: Reducing Waste in Otaki. Speaker Simon Calcinai, KCDC Waste Minimisation Officer. Wednesday 24 September, 6pm, 47 Te Manuao Rd: What are the main issues facing the Otaki community in 2014/15? James Cootes, Otaki Community Board.